With but a day left on Hrach's visa, Jo Magpie and her husband find themselves seemingly unable to leave Turkey. High winds rattle the truck windows. The weather is turning against us. Between rides we wait by the roadside as puddles sloosh over us. We wait an infinitely long time, given that we are still in the hitchhiking paradise that is Turkey. Evening creeps in and we spy a bus in the distance. We arrive in Marmaris in the bus, in now torrential rains. This isn’t how it was supposed to be. The bus station is some way out of town and I don’t have any money. There is no bank machine. We wade through the rain, sloshing into puddles and drowning our trouser legs. Eventually we find a bank machine, and soon after, the sanctuary of a bakery with internet. I have no idea how to buy a ferry ticket, and when I go to the company website, I’m in for a nasty surprise: all boats have been canceled due to the storms. I punch the letters of my keyboard rapidly, trying one site and then another. Everything is canceled. The only way to leave Turkey is through Istanbul, 800km to the north. Hrach has one day left on his visa. There are no boats for at least several days. I order another coffee and try to process this information. How the hell can we get to Istanbul and leave the country before Hrach’s visa expires? After the luck we’ve had today it just doesn’t seem possible. The year is still young and there’s deep snow in the north. Anticipating Greek islands, I have already left my coat and warmest clothes at various stays along the road. The north of Greece is also under deep snow this time of year. My heart thuds to the floor at the anticipation of the next couple of weeks, slowly hitchhiking along icy roads. We have already arranged hosts in Athens and Rhodes island with really lovely couchsurfing hosts that we were looking forward to meeting. 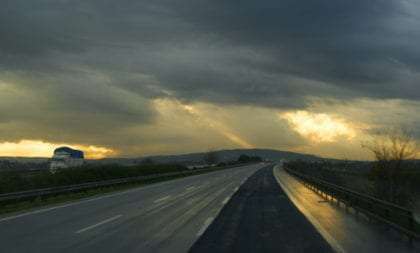 There are times during long journeys when everything seems to fall into place effortlessly, easy rides, adventures at every turn, food almost falling from the sky. Then there are times when everything seems to turn against you. Apparently we have passed from the first category into the second one. We must have taken too big a withdrawal from our good luck fund some way back and this is the price to pay. We grapple with the few options we have. It seems we are going to have to take another flight. I once pledged never to fly again. In the past year and a half I have already taken two flights. I guess when I made that pledge, I hadn’t banked on getting married to someone without a highly privileged passport. Well, I hadn’t banked on getting married at all. I spend an hour checking flight options, slowly drip-drying onto the bakery floor. I order a slice each of baklava to cheer us up. We could take a flight to Athens, which would be very expensive, then continue with our plan of taking boats to Italy and then to Spain, or we could take a slightly cheaper flight to another South European country, save the money on the boats and hitchhike around the coast instead. “Why don’t we just fly to Spain?” Hrach asks. I look at him, stunned. That option hadn’t even occurred to me. But after a few minutes of discussion and pondering, the idea has taken route. If we have to fly, why not just fly to Spain? There are cheapish tickets From Istanbul to Barcelona leaving the following night: the very last night of Hrach’s visa. 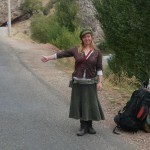 We can hitchhike much more slowly in Spain and make our way to the South. But first, we have to get back to Istanbul.